In this figure, side , , and . What is the value of angle ? Since , we know we are working with a right triangle. 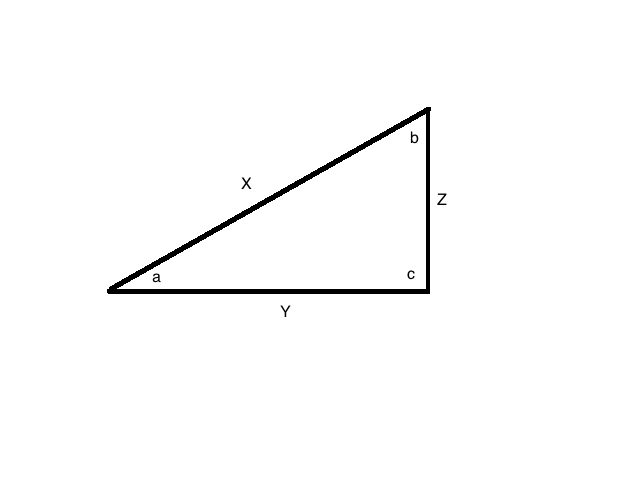 Let ABC be a right triangle with sides = 3 inches, = 4 inches, and = 5 inches. In degrees, what is the where is the angle opposite of side ? We are looking for . Remember the definition of in a right triangle is the length of the opposite side divided by the length of the hypotenuse. In this figure, if angle , side , and side , what is the measure of angle ? In this figure, , , and . What is the value of angle ? Notice that these sides fit the pattern of a 30:60:90 right triangle: . Since angle is opposite , it must be . A triangle has angles of . If the side opposite the angle is , what is the length of the side opposite ? The pattern for is that the sides will be . If the side opposite is , then the side opposite will be . Stony Brook University, Bachelor of Science, Biology, General.